Over the past year, I've had a real change in relationship to food, kicked off by my introduction to Ayurveda, where their belief is that food is medicine. Before that, I'd sort of stumbled along, going with what I'd always eaten, or what seemed to work for me or other people, or just following general principles of moderation. Essentially my theory was, go with what you want to eat, but at the same time use your brain! Feel free to eat cake if it's someone's birthday at work (and don't feel guilty about it), but it's probably not great to eat it breakfast, lunch and tea. Maybe have a salad for lunch! But I never considered specifically what was good for me or not, the effect it was having on my mind-state and overall health, the source and preparation of food, the impact on the globe etc etc. Ayurveda really opened my eyes to how the preparation and types of food you eat can have a big impact on your life. And it also made me actually pay attention to how my body felt after specific foods, creating many a revelation of 'ooohhh, it's that food that makes me feel bloated / gassy / tired / lethargic / on edge' and so on. I was definitely one of those. I just assumed everyone felt like going to sleep after eating a bowl of pasta...or that your tummy mightn't be all that great after ice-cream. You mean that indicates that perhaps it's not best for keeping my body running at optimum performance levels...what?! At the moment I'm studying Life Nutrition, which looks at nutrition and food using a holistic framework...it certainly goes beyond the food pyramid - much beyond that! And I'm loving learning more and more about it, because nutrition isn't something that has come naturally to me - not an innate knowing or interest. So back to the original topic - is it a case of food, glorious food for you? Or is it just fuel to keep your body running? Is it just something you stuff into your mouth to silence the hunger pains and give you enough energy until the next snack? Do you eat on the run or do you like to sit down and enjoy your food? Do you eat alone or with others? Can you actually remember what your last meal tasted like?! Do you link food with your overall health, both in the short-term or long-term? Do you think it can cause illness or other issues? Have you ever taken a step back after you've eaten to assess how it affects your mind and body? Do you consider the source of your food when you buy it...as in do you like buying locally or organic? Maybe you have your own vege patch in the backyard? Is freshness important, or do you like cooking up a big meal and freezing it for later? Do you have any ethical ideas about food...are you vego or vegan...or do you only buy fair trade? No criticism for whatever you think, I'm just finding the whole topic more and more fascinating because I personally had never considered that what I eat and why I eat it can have so many dimensions! And I'd never really considered any of the questions above. Unfortunately I think I've been a great example of how a lot of people think about food now - in short they don't! I think the vast majority of people are disconnected from their own nutrition. And it's not really hard to see why. Food confusion is rife, because there's so many mixed messages that come at you every single day from magazines, TV, food packaging, recipe books and people you speak to. All of it disempowers you, leaving you to believe that only someone else - be it a celebrity, doctor or a friend - can tell you what's right for you. Really? Are they living in your body with you?! I think I've definitely always been one of these people, and it's only in recent times I've realised the true benefit of looking within to see what works for me. And I'm still learning! In general, we live in such a fast-paced society, that convenience and quick fixes are the norm. Then there's the ever-increasing stress and pressure that plagues our country - so the fact that many people choose foods that make them 'feel good' in the short-term, but cause health problems in the long-term isn't surprising either. I find it really funny at work when I'm heating up my lunch and someone walks into the kitchen and asks me what I'm having. And I suppose the answer is yes to both questions, but what makes me laugh is that eating something involving vegetables or 'being healthy' is so weird!! Then if I go on to explain that I don't eat wheat, dairy or red meat - some people's heads almost explode with the shock of that statement!!! Oh and don't get me started on trying to rid the world of the statement 'it's expensive to eat healthy'...that could go on for hours! At any rate, if you haven't given food any thought before, I hope this has got your brain ticking over a little bit. And lastly - I hope you enjoy whatever meal is on your plate next! 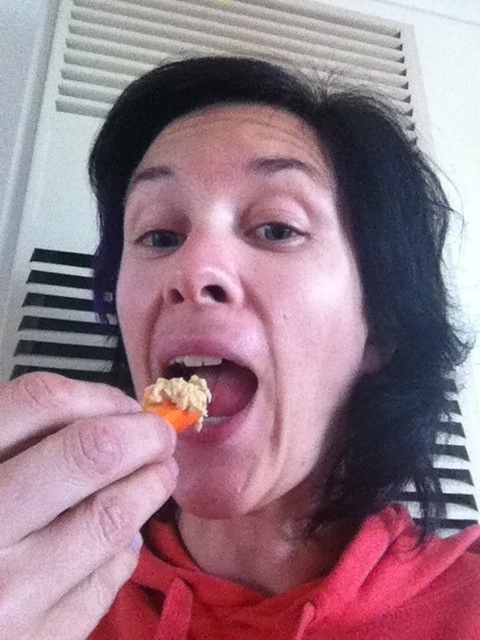 I know I will - here's my home-made hommous with carrot...and I've got homemade hot chips coming in the oven...using organic veges of course as that's now the norm for me...yum!! !